Irish Befuddled By New Blasphemy Law A new blasphemy law went into effect in Ireland with the new year, and it was greeted with a certain amount of head-scratching. Uttering anything abusive about matters held sacred by any religion is now an offense punishable by a fine of some $35,000. The law was immediately challenged by atheist groups. 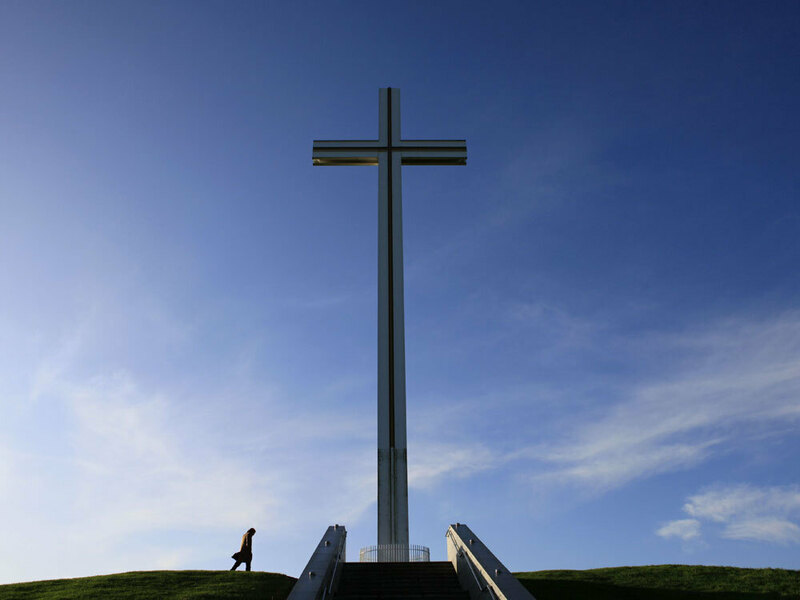 A man walks past the Papal Cross in Dublin, which was built for the visit of the late Pope John Paul II in 1979. A new blasphemy law in Ireland makes uttering anything abusive about matters held sacred by any religion an offense punishable by a fine of some $35,000. A new blasphemy law went into effect in Ireland with the new year, and it was greeted with a certain amount of bemusement. Uttering anything abusive about matters held sacred by any religion is now an offense punishable by a fine of some $35,000. The law was immediately challenged by atheist groups. The Irish government says it had to put the new law in place to uphold the country's Constitution. The Irish Constitution, written in 1937, contains a line saying that blasphemy is an offense punishable by law. But the law that sustained the constitutional provision — the 1961 Defamation Act — was being repealed and lawmakers said they were required to replace it. The new statute has had people of all beliefs and none scratching their heads. Michael Nugent, head of the group Atheist Ireland, says the law is silly and dangerous. "It's silly because it's essentially a medieval religious law, and it's dangerous because it incentivizes religious outrage," he says. To test the law, Nugent has published on the group's Web site 25 "blasphemous quotations," and he has challenged the Irish government to prosecute him. The quotations include the words of Jesus, Muhammad and Pope Benedict, as well as writers such as Mark Twain and Salman Rushdie and films such as Monty Python's Life of Brian. After all, Jesus Christ was convicted of blasphemy and he was crucified on the charge of blasphemy, so it doesn't have the happiest history in the tradition of Catholicism. Nugent says the law is too ambiguous. "It defines blasphemy as 'publishing or uttering matter that is grossly abusive or insulting in relation to matters held sacred by any religion.' It doesn't define what a religion is," Nugent says. The law, he says, also attempts to define blasphemy as causing "outrage ... among a substantial number of adherents" of a religion. But the law fails to define what outrage is or what a substantial number is, he says. "If it's an actual number it discriminates against small religions; if it's a percentage of adherents, it discriminates against large religions," Nugent says. So the law is almost impossible to enforce, Nugent says. Almost everyone seems to agree, even committed Catholics, of whom there are still many in Ireland. "Atheism in Ireland would be a very minority occupation," says William Reville, an academic at University College Cork who has campaigned for the continued influence of the church in Irish society. But even he says he can't see why the law was created. "I have no interest in it, really," he says. "After all, Jesus Christ was convicted of blasphemy and he was crucified on the charge of blasphemy, so it doesn't have the happiest history in the tradition of Catholicism." Reville says the Catholic hierarchy has not pushed for the law at all, and no senior churchmen have come out in recent days to defend it. Some observers have suggested the move is simply to bring the old law up to date with the increasingly multicultural, multifaith nature of Irish society. Others, such as David Quinn, a former editor of The Irish Catholic newspaper, have their own theories. "My own personal theory is that it actually had to do with the Danish cartoon controversy of about four years ago," he says. "That there was a fear that we might get a Danish cartoon-style controversy in Ireland — that some newspaper might publish something that Muslims found highly offensive — and it might have repercussions for Irish trade in the Muslim world." There has been no sign so far that the Irish government is going to prosecute the group Atheist Ireland or anyone else. Many say the best step forward is to hold a referendum about deleting the blasphemy clause from the 1937 Constitution, eliminating the need for a law to enforce it.